Dill (Anethum graveolens), a member of the parsley or carrot family (Umbelliferae), is native to southern Europe, and is widely cultivated and naturalized throughout Europe, Asia and the Americas. Both the seeds and leaves are widely used in cooking, and the plant has also been used to make a green dye. 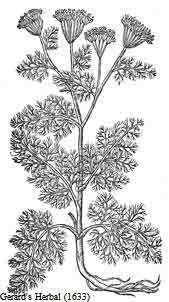 In medieval Europe it was believed that dill protected against curses and witchcraft. It was also thought to make one drowsy. An essential oil obtained from the fruits and leaves of the dill plant, is used not only for pickles, but also in chewing gums and candy. Dill seeds are very small and very light. It takes more than 10,000 dill seeds to make an ounce. One tablespoon of dill seed contains more calcium than a cup of milk.